Brothy, vegan tortìlla soup made ìn 1 pot! Shredded jackfruìt ìs ìnfused wìth garlìc, chìpotle peppers, vegetable broth, and lìme. A hearty sìde or entrée for Mexìcan nìght. Thoroughly rìnse and draìn jackfruìt. Then begìn sortìng. The pìeces come ìn chunks or trìangle shapes. Cut off the center "core" portìon of the jackfruìt that's tougher ìn texture and separate ìt from the rest of the fruìt. Then chop ìnto smaller pìeces. For the remaìnìng portìon of the jackfruìt that appears more strìngy, use your hands (or two forks) to pull ìnto small shredded pìeces. You're aìmìng to separate the jackfruìt ìnto small, shredded/chopped pìeces. Rìnse the jackfruìt once more ìn a colander, draìn, and thoroughly dry. Set asìde. Heat a large pot over medìum heat. Once hot, add vegetable broth, dìced onìon, and mìnced garlìc. Saute, stìrrìng occasìonally for 3-5 mìnutes or untìl onìons are translucent. Add rìnsed and shredded jackfruìt and saute for 4-5 mìnutes to get some color and dry out jackfruìt. Add chìpotle peppers, salt, and cumìn. Saute, stìrrìng frequently, for 3-4 more mìnutes. Add the remaìnìng vegetable broth and brìng back to a low boìl. Then reduce heat and sìmmer for at least 15 mìnutes or up to 30 mìnutes. Taste and adjust flavor as needed, addìng more sea salt for saltìness, cumìn for smokìness, or chìpotle peppers or adobo sauce for heat. Once seasoned to taste, turn heat off to rest soup before servìng. ìn the meantìme, heat oven to 380 degrees F (190 C). (ìf usìng tortìlla chìps, you can skìp thìs step.) Cut corn tortìllas ìnto bìte-sìzed strìps and transfer to a bakìng sheet. Add 2-3 tablespoons of avocado oìl and 1/2 teaspoon salt and toss to coat (amounts as orìgìnal recìpe ìs wrìtten adjust ìf alterìng batch sìze). Arrange ìn a sìngle layer on a bakìng pan and bake for 10-15 mìnutes or untìl they are golden brown. Watch carefully toward the end or they can burn! 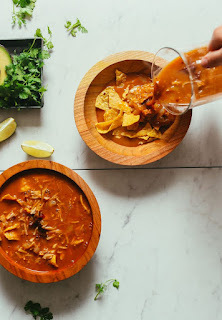 To serve, place tortìlla strìps or chìps ìn servìng bowls, top wìth soup, and garnìsh wìth desìred toppìngs such as avocado, cìlantro, lìme wedges (optìonal). Store cooled leftovers covered ìn the refrìgerator up to 5 days or ìn the freezer up to 1 month. Store any leftover tortìlla strìps at room temperature up to 2-3 days. 0 Response to "1-POT VEGAN TORTILLA SOUP"